Slack.com doesn't release an official client for Linux. 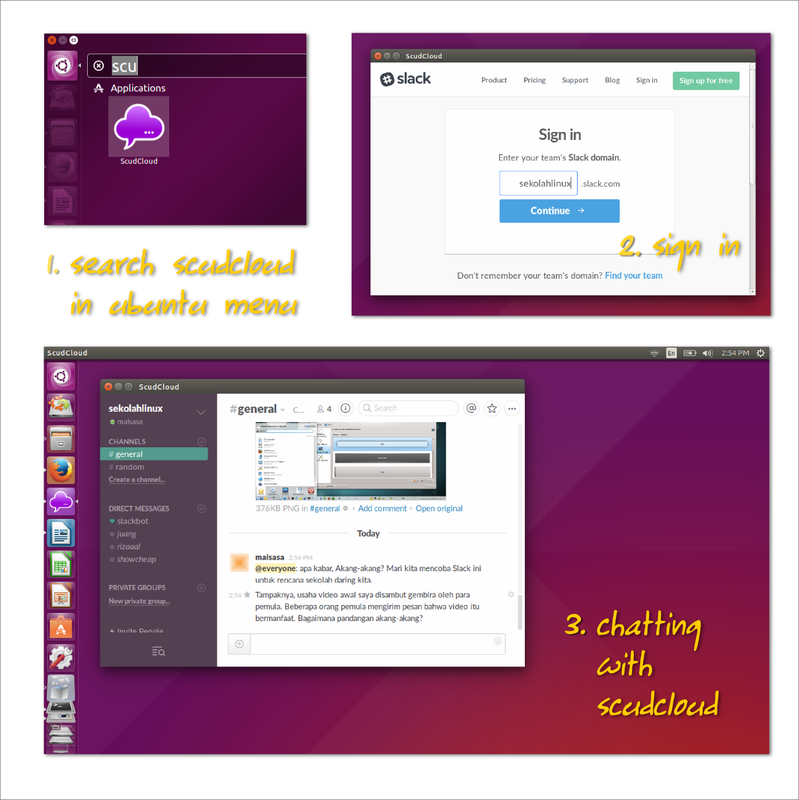 But thanks to Rael Gugelmin Cunha (raelgc), he created an unofficial Slack.com client for Linux. It is ScudCloud (not to confuse with Soundcloud). It is available for Debian, Ubuntu, Kubuntu, Mint, Fedora, and Archlinux. I will show you how to install it on Ubuntu and another distros. According to its official documentation, this PPA of ScudCloud can also be installed in Debian, Kubuntu, and Mint. You are advised to upgrade first (sudo apt-get upgrade) before installing ScudCloud because it may crash with some old system components. For Ubuntu 12.04, don't use this but use next section. Installing on Ubuntu 12.04 is different with others. According to official ScudCloud documentation, Slack is not compatible with libqtwebkit4 in 12.04. You must upgrade it first and run the same commands then. Addition of this qtwebkit4 PPA will automatically force apt to install the newer libqtwebkit later. Fedora 21 - Use a yum repository available here. Select Fedora there. CentOS 7 - Use a yum repository available here. Select CentOS there. Archlinux - Use this PKGBUILD from AUR. You may use yaourt, cower, or another AUR package manager to install it. Compile from Source - Use the ScudCloud source code available if you use an unsupported distro or if you want to contribute a package for ScudCloud. Follow the official instruction here. Open ScudCloud from Ubuntu menu then log into your Slack domain then just chat.